UBC scientists have scanned the genome of cannabis plants to find the genes responsible for giving various strains their lemony, skunky or earthy flavors, an important step for the budding legal cannabis industry. "The goal is to develop well-defined and highly-reproducible cannabis varieties. This is similar to the wine industry, which depends on defined varieties such as chardonnay or merlot for high value products," said Jörg Bohlmann, a professor in the Michael Smith Laboratories and faculty of forestry at UBC. "Our genomics work can inform breeders of commercial varieties which genes to pay attention to for specific flavor qualities." They found about 30 terpene synthase genes that contribute to diverse flavors in cannabis. This number is comparable to similar genes that play a role in grapevine flavor for the wine industry. The genes the researchers discovered play a role in producing natural products like limonene, myrcene, and pinene in the cannabis plants. These fragrant molecules are generally known in the industry as terpenes. "The limonene compound produces a lemon-like flavor and myrcene produces the dank, earthy flavor characteristic of purple kush," said Booth. "There is a need for high-quality and consistent products made from well defined varieties." he said. This study was done on the hemp strain "Finola" and in their own discussion they refer to the notable differences in the few known genes in the drug form "Purple Kush" and those in "Finola" which produce the same terpene. 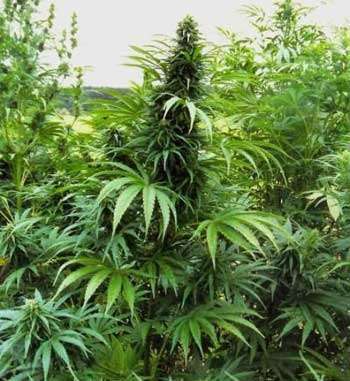 The full library of terpene-producing genes in Cannabis varieties is likely to be quite huge. I thought myrcene has a mango scent. It certainly contributes to both Old World mango scent and that of the mango ginger.